If you've never been any good at racing games (like me), but want to participate in the motorsport gaming world, then it's possible that a management and strategy simulation may be more your style. I've previously found that racing management games are either too simple, or far too complex, but Grand Prix Story has arrived at a good balance. Created and developed by Kairosoft Co, Grand Prix Story follows in the footsteps of Game Dev Story, Pocket Academy and Mega Mall Story. The concept of each is similar - you manage a team of people to become the most successful and earn the most money. With GP Story, you're in charge of a brand new racing team. You start with a driver and a number of mechanics, with the most basic of cars to work on. Entering races and competing in events gains you development points, which in turn can be used for researching new parts and upgrading those that are already on the car. You can enter single races, or participate in a Grand Prix championship. As you get more successful, you'll attract sponsors, who will pay you money which helps you train up your staff to work more efficiently. With better results, you'll be granted an expanded garage to run two cars, and you build up from there. As mentioned, the gameplay is simple to grasp hold of, and easy to leave for a while and come back to. There are enough options to keep you interested (and/or addicted) but not so much that it is completely overwhelming. You get off to a slow start, it takes a while before you win a race, but once you do, things flow much better. 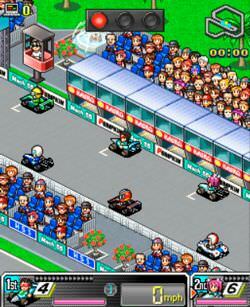 The graphics are of a specific style, as all the Kairosoft games are in the same pixellated fashion - it isn't exactly easy on the eye but can be quite sweet when you see the cars racing. You don't get to participate in any of the racing action, except occasionally choosing when to use a speed bonus. Even so, the races are the perfect length to keep attention and the on track battles can be pretty exciting at times - particularly as you're so invested in the results. I wasn't all that keen on the moment the game ended. I was in the middle of a Grand Prix Championship, just preparing for the next race, and a popup informed me the game was over. It calculated my score by adding up how much money I had, and how many upgrades I'd completed, and presented me with the final tally. For a moment, I thought that was it and my game had abruptly finished, but I was allowed to continue playing. All further results wouldn't count towards my high score but at least all that hard work wasn't just thrown out of the window as abruptly as I'd thought. Overall, I'd highly recommend checking it out. The style of game is an acquired taste - not appealing to everyone, but for those that want a go at managing a team, it's a good introduction. The game kept me addicted for a couple of days, although I don't think it's something I'll return to and play over and over again. I'll keep my team going to see how far they can go but I can't say that going through all that building up process again is something I'm anxious to repeat. 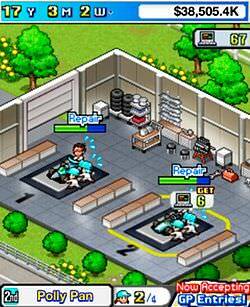 The game is available for iPhone and iPod Touch from the App Store, as well as on Android devices. There's an official Formula 1 iPhone app, and it rocks!